Syriza has won elections again in Greece. Yet with each passing turn of the electoral screw access to real power is further restricted. Most international commentators are already blaming the record abstention at this weekend's elections (nearly fifty percent) on the failure of Greek parties to meet voters' aspirations. Yet in such a situation of imposed constraints on democracy by the European power structure - in which even the attempt to bring electricity to the poorest homes is vehemently opposed by external creditors - there is little wonder that so few bothered going to the polls. Alexis Tsipras - for it is increasingly to the individual that the media refer, rather than the collective whole of the party - has two broad models on which to base his radical compromise with neoliberalism. The first - perhaps the "ideal-type" of contemporary socialist failure - is that of Francois Mitterrand in France. Against the tide of state bankruptcy in Europe, Mitterrand ran the 1981 election in France on the promise of a definitive break with German tight money policies and a defiantly Keynesian, pro-labour economic reflation. While becoming France's most successful ever Socialist leader, Mitterand - gradually and then rapidly - adjusted to neoliberal realities. Germany and the US stuck to deflationary policies in the crucial first years of the Mitterrand government, also those of a recession that was being used to end inflation in the capitalist heartlands. With France peculiarly economically vulnerable and uncompetitive, a position of temporary deferral of the electoral program was developed, to be substituted by "rigueur" (austerity) and the "franc fort" (strong franc) bound (via the EMS) to the German DM. The French government either would not or could not break decisively with Europe and the US, and piece by piece the ambitious Keynesian plans were dropped. The only alternative to this capitulation was perhaps direct control of newly nationalised banks and increasing state control over investment. These in the end were steps that went far beyond the left's Common Program (ironically shared by the Communist Party). Tsipras and Syriza have never promised anything as extensive as France's Common Program. Nor have they flirted with so radical a break with orthodox monetary policy as running outright deficits. Yet the reversal of course has been equally deep, if sooner and more rapidly extracted. The latter reflects not only the size of the Greek economy but also the Greek state's sorely reduced power as a vassalised EU hinterland. Mitterrand was, for all his reversals, the most successful of France's postwar Socialist politicians. Under his watch French "dirigisme" was done away with, as privatisation - in step with, and even ahead of, the global fashion - advanced in the name of restoring private investment levels and profitability. Mitterrand had once proclaimed the need for "revolutionary reforms" to French capitalism. In his later years he became obsessed with inflation, efficiency and productivity, which were restored via private means at enormous expense to French people in terms of employment and welfare. Such an ideological volte-face must surely await Tsipras, as the commitment to neoliberal structural reforms becomes a less reluctant one. Yet there are happier precedents for such integrations into the neoliberal world system. Luiz Inacio Lula de Silva ended his political career In Brazil on a high: his time as President from 2003 to 2011 had seen massive reductions in poverty via the famous Bolsa-Familia payment. This was a conditional cash transfer made to mothers in order to keep them out of poverty and to boost the consumption of the poorest. The Brazilian economy boomed under Lula, who had become the acceptable face of Latin American populism in the west. Lula was initially much more popular than his Party: a no-nonsense worker who had risen to the top of the Worker's Party (Partido dos Trabalhadores) and become its presidential candidate. Later things would even out as this left-populist party of the social movements took office in the country at large. Once again, Lula was plagued by public debt and set about arranging for its control by the most orthodox means. In Lula's early years growth fell and unemployment rose as he cut his way to an IMF-pleasing surplus. Amid a commodities boom and a glut of cheap capital goods from a financially efflorescent US, Brazil entered a period of major growth. These funded Lula's welfare system and allowed the effects of fiscal restraint to be watered down. In reality, the Bolsa-Familia, despite its clearly measurable and extensive impact on poverty (it very cheaply helped families increase their independence and private consumption, and in combination with increases in the minimum wage, led to a drop in poverty from 50 to 30 million in just six years), did little to challenge the increasingly conditional character of social security. Instead of a human right, benefits have become means of imposing behavioural norms on citizens (asking mothers to prove their kids' school attendance). Though this hardly undermines the payment's significant achievements, it suggests the limits inherent to Lulaist reformism. The price of Lula's acceptance by US-dominated global capitalism - bought at the cost of strict fiscal limits and arm's length treatment of the private sector - was the perpetuation of a system riddled with corruption. In order to buy its place in the state, and to have its social policies effectively introduced, the PT had to sacrifice its plans to transform the state proper. If the balance of forces was nudged in a direction broadly favourable to the poor and elderly in Lula's Brazil, limited social change was enabled by a peculiar maintenance of the status quo within the state. The results are a strong social legacy in the country at large, combined with political inertia and criminal deterioration of the PT as a governing force. The party under Lula's successor, Dilma Rousseff, has suffered greatly from the cost of this past success, in which corruption has become fully systematised as a governing way of life. 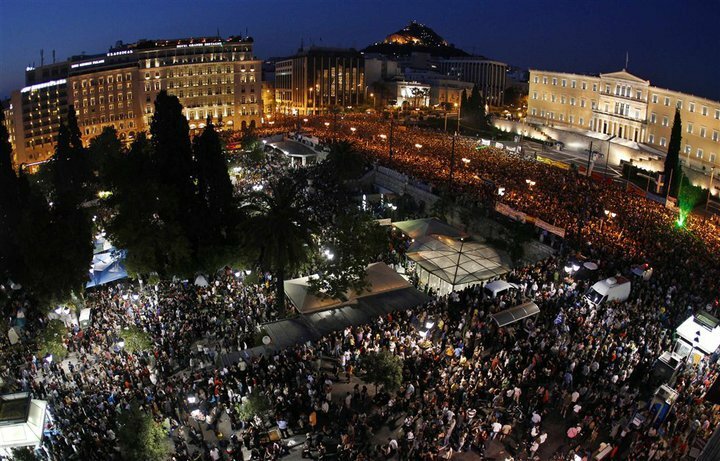 Tsipras returns to government in a country caught between these two extremes, a position which exaggerates the contradictions of neoliberal capitalism. His room for running an expansionary program is constrained by being at once a delinquent and discredited member of the advanced groups of countries and, at the same time, a grotesquely unequal and very poor country. Such, however, are the contradictions of societies situated at capitalism's "weakest link." Greece is politically and socially explosive not only because of its poverty, but because it is forced to act as if it was wealthy. There are legal particularities that further proscribe Tsipras's room for manoeuvre. The EU treaty system and the euro itself act as a highly efficient muscular system of European neoliberalism. What took two years to do in France took less the six months in Greece: the total subordination of society to an extreme, even unprecedented, program of social cuts and privatisations. Here, then, is the rub: Tsipras may aspire to either Mitterrand's or Lula's successes, that is, incorporating either left electoral victory or popular social reform into a neoliberal framework. However, he operates with deeper restrictions than either. In France the economy eventually became manageable as a result of successive devaluations, the latent potential for liberal reform in the economy, and the driver of eventual global recovery. The Greek economy lacks either possibility. Meanwhile, Lula could cheaply lift millions out of poverty due to the extremities of Brazilian inequality and his otherwise orthodox fiscal policies. By the middle of their careers neither Mitterrand nor Lula provoked much opposition abroad. Tsipras's fate may be one of equal mediocrity with none of the tangible successes - orthodox or otherwise. As with his predecessors constructive reform and alteration to the neoliberal model is blocked for Tsipras. Yet unlike them, a neoliberal style recovery - slow and immeasurably painful, with deflation and fiscal rectitude at its heart, accompanied by a return to profitability and enduring unemployment - may elude Greece. The likelihood is a return to the crucible of social destruction personified by the peak crisis years of 2008-2011. In this last, however, Greece's fate is probably not so unique.